For children confronting cancer, amputation takes as much of an emotional toll as a physical one – a reality that is poignantly depicted in the powerfully moving animated short film created by the STUDIO, which dramatically tells the story of 6-year-old Scarlett Aida Rivero Osejo and her journey following the loss of her right leg due to Ewing Sarcoma, a bone cancer that affects mostly children. 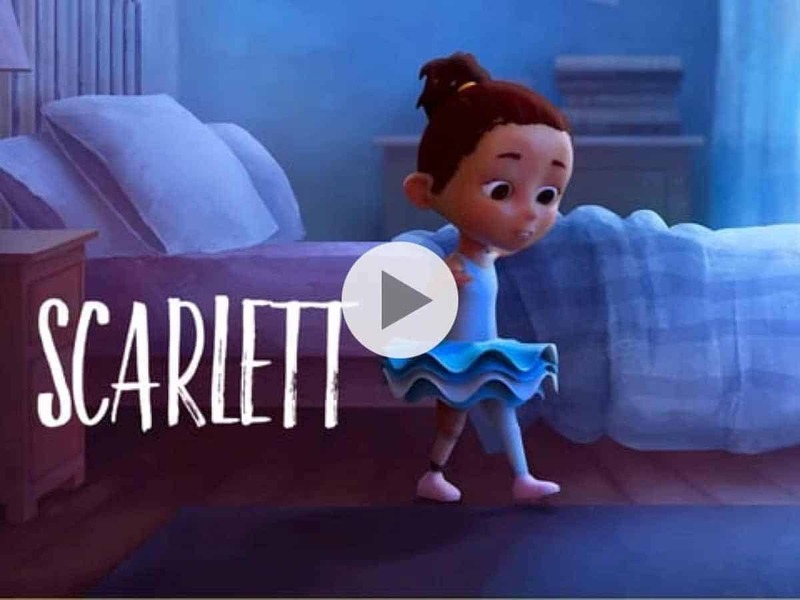 The 3-minute short, entitled simply “Scarlett,” is playing pivotal role in both helping raise awareness for both the Scarlett Contra el Cancer foundation and April’s Limb Loss Awareness Month (#LimbLossAwarenessMonth). The short is fast becoming a worldwide hit on social media, played over 70,000 times in over 150 countries in less than three days, with unsolicited media coverage from international press. Combining a 3D-animated Scarlett character with 2D backgrounds that feature hand-painted, watercolor textures, “Scarlett” — featuring an original song from bicoastal music house Hook+Line — opens on a shot of a conflicted Scarlett following her amputation. Seemingly enveloped in a world of dark colors that visually symbolize her struggles to adapt to her new prosthetic, the film takes viewers through her journey from feeling at first overwhelmed and isolated by her new physical limitations, to overcoming them through her love of dance. The short ends with a final scene demonstrating Scarlett’s transformation by showing her empathy for a boy facing a similar struggle. Running concurrently through Scarlett’s narrative, is a series of visuals depicting red shapes swirling in sea of blue while a tiny, clear orb bounces around the environment meant to symbolize Scarlett’s existential struggle and anxiety. At first overwhelmed by red, as Scarlett’s mood lifts the color shifts to a warmer blue. For Nittolo, the challenge was how to skillfully weave the two parallel storylines to create an emotionally inspiring crescendo. Currently the video has reached over 1.1 million people. The video received thousands of comments of gratitude and encouragement to keep making more content. After the overwhelmingly positive reception after the launch of the video, the STUDIO shared a coloring book pages for the kids to continue Scarlett’s story on the video’s Facebook fanpage. Their hope is to create more content for children going through pediatric cancer and their specific stories.